The team of (from left) Scott McDonald, Jon Buek, Scott Chadwick and Wes Forget captured the Ontario Tankard in Elmira, Ont. this weekend. Submitted photo. Nine years ago Napanee’s Scott Chadwick was in the stands watching as Glenn Howard won the 2010 Ontario Tankard at the Strathcona Paper Centre. 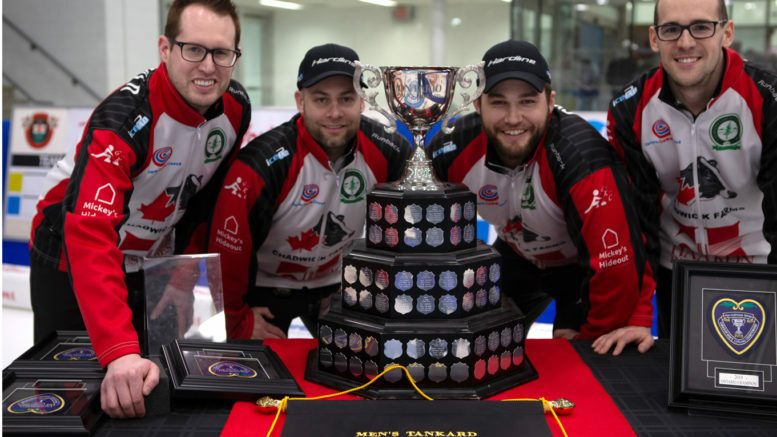 On Sunday Chadwick was on the ice in Elmira at the 2019 Ontario Tankard, serving as lead for Scott McDonald and capping an 11-0 week to capture the provincial curling title and earn a berth in next month’s Tim Horton’s Brier. McDonald bested John Epping 8-2 in six ends in Sunday’s final to clinch the championship. Earlier in the week McDonald’s rink, which curls out of the Cataraqui Golf and Country Club, bested Howard 7-5. McDonald’s perfect record earned the rink an automatic berth to the finals while Epping and Howard squared off in the semifinals, with Epping winning 8-6. This marked the first year Chadwick had paired with London, Ont.’s McDonald. His team is rounded out by second Wes Forget and third Jonathan Beuk, both from Kingston. This marked the fifth time Chadwick had competed in a Tankard, first time winning. Having spent the first 15 years of his career with the Napanee District Curling Club, he says it was a great source of pride to become the first member from his hometown club to win a Tankard and qualify for the Brier. In the meantime he’ll be training for the Brier, which will take place March 2-10 in Brandon, MB and will feature the top curlers from across Canada.